This oil painting was created in the spring of 2013. 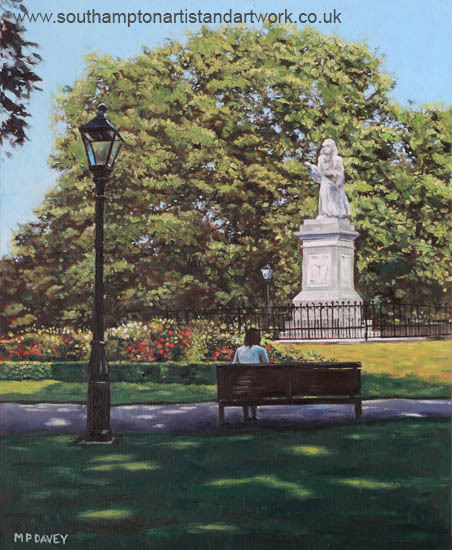 It depicts a girl sitting on a bench in Watts Park, Southampton, waiting for an event unknown to the artist, with only a statue and lamp post for company. The statue featured is one of Sir Issac Watts, an English hymn writer, a resident of the town and born there in 1674. The park is also named after him. The painting is based on a photograph taken during an autumn day a few years previously. The oil painting is on canvas board measuring 16” x20”, initially painted with a red acrylic base.